Remove the rear wheel assembly. 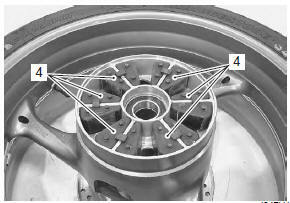 Refer to “rear wheel assembly removal and installation” in section 2d . Loosen the rear sprocket nuts. Draw out the rear sprocket mounting drum (1) along with the rear sprocket (2) from the wheel hub. 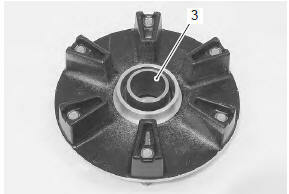 Remove the rear sprocket nuts and separate the rear sprocket (2) from its mounting drum (1). Remove the wheel dampers (4). 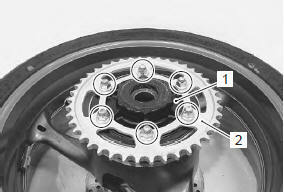 apply grease to the contacting surface between the rear wheel hub and rear sprocket mounting drum. Apply special tire lubricant or neutral soapy liquid to the wheel damper surfaces “a”. never use oil, grease or gasoline on the wheel damper in place of the tire lubricant or neutral soapy liquid. Apply grease to the retainer. 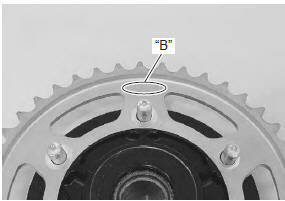 Install the rear sprocket so that the letters “b” face outside. 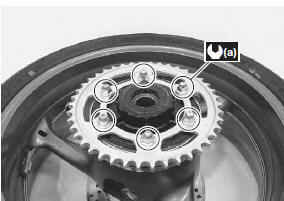 Tighten the rear sprocket nuts to the specified torque. Install the rear wheel assembly. 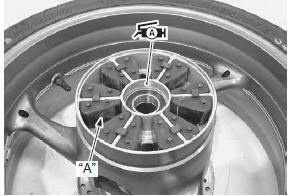 Refer to “rear wheel assembly removal and installation” in section 2d .